Albert Stephen Lins was born on 26 December 1881 at Wisconsin. He was the son of George Lins and Theresa Rieder. Albert Stephen Lins married Anna Pronold, daughter of Sebastian Pronold and Mary Voelkel, circa 1906. Albert Stephen Lins died on 12 June 1969 at age 87. Leo Joseph Lins was born on 22 July 1884 at Wisconsin also reported as 22 Jul 1883. Leo Joseph Lins married Eva Magdalene Schwartz before 1909. Leo Joseph Lins died on 10 February 1956 at age 71 also reported as 11 Feb 1955. [S243] U.S. Federal Census 1920 U.S. Federal Census, by Ancestry.com, Year: 1920; Census Place: Troy, Sauk, Wisconsin; Roll: T625_2015; Page: 2B; Enumeration District: 180; Image: 491. George Edward Lins was born on 13 February 1885 at Wisconsin. George Edward Lins married Catherine Volk, daughter of Phillip Volk Sr. and Mary Zoerg, before 1909. George Edward Lins died on 25 October 1965 at age 80 George Lins, 80, obituary. George Edward Lins obtained US Social Security Card at Wisconsin; last residence Wisconsin. Married Name before 1908 As of before 1908,her married name was Wiest. Margaret J. Lins was born in February 1887 at Sauk, Wisconsin. Margaret J. Lins married George Lenard Wiest before 1908. 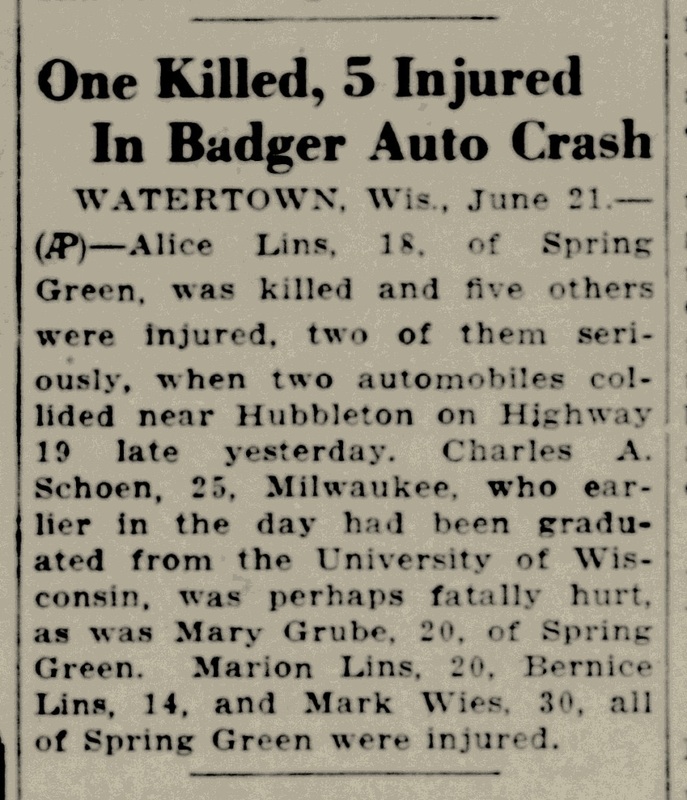 Margaret J. Lins died in December 1964 at Dodgeville, Wisconsin, at age 77 Mrs George Wiest (Margaret Lins) obituary. Otto Clemence Lins was born on 27 September 1890 at Wisconsin. 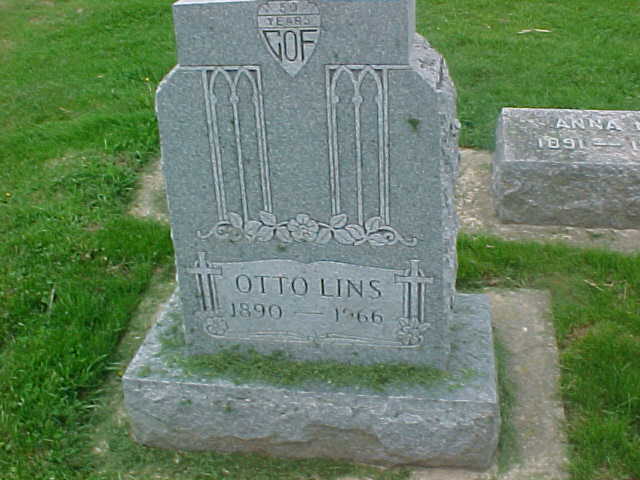 Otto Clemence Lins died on 25 February 1966 at age 75. He was buried after 25 February 1966 at St Luke Catholic Cemetery, Franklin, Sauk, Wisconsin. Frank Joseph Lins was born on 28 August 1892 at Wisconsin. Frank Joseph Lins married Cecelia M. Gruber after June 1917. 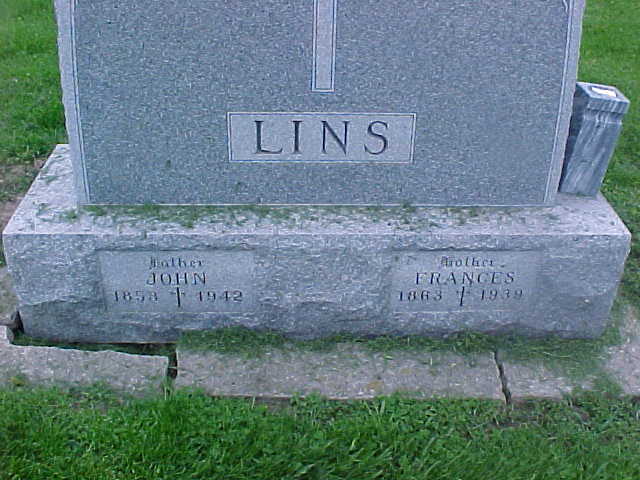 Frank Joseph Lins died on 12 October 1988 at age 96. Frank Joseph Lins obtained US Social Security Card at Wisconsin; last residence Baraboo, Sauk, Wisconsin. On 5 June 1917 at World War I Draft Registration, Sauk, Wisconsin. Walter Roman Lins was born on 21 February 1897 at Wisconsin also reported as 22 Feb 1897. Walter Roman Lins married Rose H. Brokish after June 1918. Walter Roman Lins died on 12 February 1986 at age 88. Walter Roman Lins obtained US Social Security Card at Wisconsin; last residence Avoca, Iowa, Wisconsin. On 5 June 1918 at World War I Draft Registration, Sauk, Wisconsin. Anton Alois Lins married Margaret B. Brickl, daughter of Simon S. Brickl and Barbara Blau. Anton Alois Lins was born on 17 January 1899 at Wisconsin. Anton Alois Lins died on 16 May 1993 at age 94. He was buried after 16 May 1993 at St Luke Catholic Cemetery, Franklin, Sauk, Wisconsin. Anton Alois Lins obtained US Social Security Card at Wisconsin; last residence Sauk City, Sauk, Wisconsin. On 12 September 1918 at World War I Draft Registration, Sauk, Wisconsin. Name Variation George Rieder was also known as Reider. George Rieder was born in June 1822 at Germany. He married Margaret (?) circa 1852. George Rieder died before June 1905. [S245] U.S. Federal Census 1900 U.S. Federal Census, by Ancestry.com, ED134. Dwelling 178. Married Name circa 1852 As of circa 1852,her married name was Rieder. Married Name circa 1852 As of circa 1852,her married name was Reider. Margaret (?) was born in October 1831 at Germany. She married George Rieder circa 1852. Margaret (?) died after June 1905. Margaret (?) had 9 with 6 living in 1900 children. Married Name 26 May 1931 As of 26 May 1931,her married name was Haas. Emma M. Lins was born on 11 December 1901 at Wisconsin. Emma M. Lins married Peter Haas, son of George Haas and Philomena (? ), on 26 May 1931. Emma M. Lins died in May 1990 at age 88. Married Name Her married name was Lins. Cecelia M. Gruber was born in 1901. She married Frank Joseph Lins, son of George Lins and Theresa Rieder, after June 1917. Cecelia M. Gruber died on 13 December 1967. Rose H. Brokish was born on 26 January 1902. She married Walter Roman Lins, son of George Lins and Theresa Rieder, after June 1918. Married Name circa 1906 As of circa 1906,her married name was Lins. Anna Pronold was born in 1886 at Wisconsin. She was the daughter of Sebastian Pronold and Mary Voelkel. Anna Pronold was born in August 1886 at Wisconsin. She married Albert Stephen Lins, son of George Lins and Theresa Rieder, circa 1906. Anna Pronold witnessed the death of Mary Voelkel on 14 May 1930 at at her daughter Anna Lins' home. Anna Pronold died in 1970. 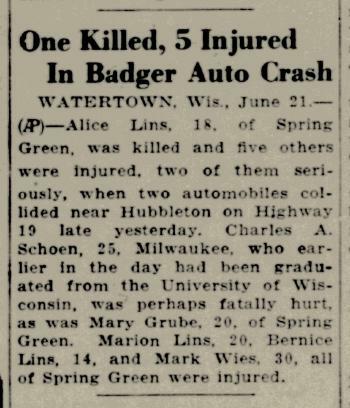 Alice M. Lins was born in 1912 at Wisconsin. She was the daughter of Albert Stephen Lins and Anna Pronold. Alice M. Lins died on 21 June 1932 Alice Lins killed in car accident. 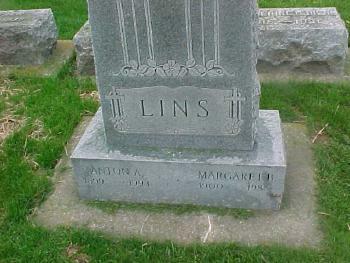 Married Name before 1909 As of before 1909,her married name was Lins. Eva Magdalene Schwartz was born on 22 July 1887. She married Leo Joseph Lins, son of George Lins and Theresa Rieder, before 1909. Eva Magdalene Schwartz died on 4 May 1988 at age 100. Grace M. Lins was born on 22 January 1913. She was the daughter of Leo Joseph Lins and Eva Magdalene Schwartz. Grace M. Lins died on 3 July 1913. Lauretta G. Lins was born on 9 December 1920. Lauretta G. Lins died on 24 December 1920. Sylvester J. Lins was born on 1 September 1916. He was the son of Leo Joseph Lins and Eva Magdalene Schwartz. Sylvester J. Lins died on 6 August 1970 at age 53. Mary Elizabeth Lins died on 26 January 1928. She was born on 26 January 1928. George Thomas Lins was born on 19 January 1922 at Wisconsin. George Thomas Lins died on 20 June 1964 at age 42. George Lins married Barbara Schwartz. George Lins was born on 22 April 1814 at Bavaria, Germany. He died on 24 June 1899 at Sauk, Wisconsin, at age 85. Barbara Schwartz married George Lins. Barbara Schwartz was born on 10 August 1819 at Bavaria, Germany. She died on 8 December 1875 at age 56. Name Variation John Baptist Lins was also known as Johann Baptist. John Baptist Lins was born on 11 November 1853 at Bavaria, Germany. He was the son of George Lins and Barbara Schwartz. John Baptist Lins married Franziska Bindl, daughter of Ignatz Bindl and Catharina Roetzer, circa 1882. 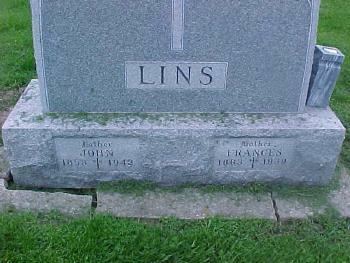 John Baptist Lins died on 11 October 1942 at age 88. He was buried after 11 October 1942 at St Luke Catholic Cemetery, Franklin, Sauk, Wisconsin. John Baptist Lins immigrated in 1871. Joseph Lins was born on 22 August 1858 at Bavaria, Germany, also reported as Aug 1854. Joseph Lins married Mary A. Hutter, daughter of Andrew Hutter and Christina Meier, on 25 November 1884. Joseph Lins died on 20 April 1956 at age 97. In January 1931 Dr Beatrice Lins, of Lawrence, Kans., and Miss Angeline Lins, of Madison, are spending the holidays at the home of their parents, Mr and Mrs Joseph Lins. Joseph Lins was a proprietor at hardware store in 1940. [S245] U.S. Federal Census 1900 U.S. Federal Census, by Ancestry.com, Year: 1900; Census Place: Spring Green, Sauk, Wisconsin; Roll: 1816; Page: 10A; Enumeration District: 0145; FHL microfilm: 1241816. Name Variation Justina Lins was also known as Austina. Married Name 27 May 1884 As of 27 May 1884,her married name was Rieder. Married Name 27 May 1884 As of 27 May 1884,her married name was Reider. Justina Lins was born on 10 June 1862 at Bavaria, Germany, also reported as Jun 1863. She was the daughter of George Lins and Barbara Schwartz. Justina Lins married Joseph Rieder on 27 May 1884. Justina Lins died on 15 December 1952 at Sauk, Wisconsin, at age 90. Justina Lins immigrated in 1872. She had 6 with 6 living in 1900 children. She was educated in 1940 at through 8th grade. [S245] U.S. Federal Census 1900 U.S. Federal Census, by Ancestry.com, Year: 1900; Census Place: Franklin, Sauk, Wisconsin; Roll: T623_1816; Page: 7A; Enumeration District: 134. [S250] U.S. Federal Census 1930 U.S. Federal Census, by Ancestry.com, Year: 1930; Census Place: Spring Green, Sauk, Wisconsin; Roll: 2609; Page: 5A; Enumeration District: 35; Image: 450.0. [S373] U.S. Federal Census 1940 U.S. Federal Census, by Ancestry.com, ED56-37. Dwelling 16. Sheet 1b. Married Name 25 November 1884 As of 25 November 1884,her married name was Lins. Mary A. Hutter was born on 27 February 1865 at Wisconsin. She was the daughter of Andrew Hutter and Christina Meier. Mary A. Hutter married Joseph Lins, son of George Lins and Barbara Schwartz, on 25 November 1884. Mary A. Hutter died on 7 November 1932 at age 67. Mary A. Hutter had 8 with 8 living in 1900 children. She had 11 with 9 living in 1910 children. In January 1931 Dr Beatrice Lins, of Lawrence, Kans., and Miss Angeline Lins, of Madison, are spending the holidays at the home of their parents, Mr and Mrs Joseph Lins. [S247] U.S. Federal Census 1870 U.S. Federal Census, by Ancestry.com, Page 9. Dwelling 62. [S246] U.S. Federal Census 1880 U.S. Federal Census, by Ancestry.com, NA Film Number T9-1446 Page Number 99B. Theodore Joseph Lins was born on 1 October 1899 at Wisconsin. He was the son of Joseph Lins and Mary A. Hutter. As of April 1917, Theodore Joseph Lins was never married. He died on 18 November 1918 at age 19. On 7 April 1917 at World War I Draft Registration, Sauk, Wisconsin. Rudolph J. Lins was born on 28 December 1890 at Wisconsin also reported as Dec 1891. Rudolph J. Lins died on 18 January 1910 at age 19. Paul Eugene Lins was born on 3 March 1906. Paul Eugene Lins died on 10 December 1909 at age 3.